The Cisco KidThe Cisco Kid is a fictional character found in numerous film, radio, television and comic book series based on the fictional Western character created by O. Henry in his 1907 short story "The Caballero's Way," published in the collection Heart of the West, as well as in Everybody's Magazine, v17, July 1907. In movies and television, the Kid was depicted as a heroic Mexican caballero, even though he was originally a cruel outlaw.Face of Death--Season 3, Episode 6--aired Oct. 19, 1952. You can watch it here. 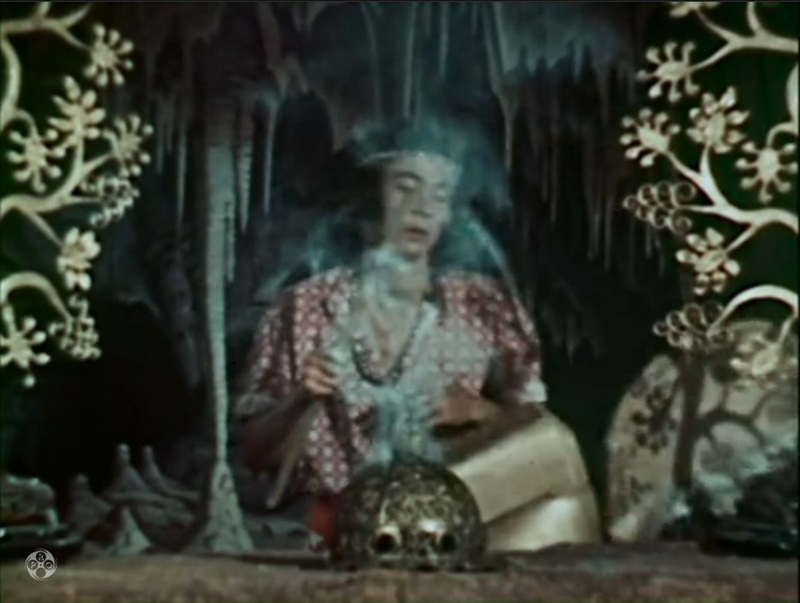 In a prologue cut from the version I saw, an Aztec priest named Quetzal leaves a treasure under the watchful gaze of a god-like "Face of Death." In the present, a professor type helps a couple of desperadoes locate the treasure somewhere near the Mexican border. They're watched by Tecia, an Indian boy in an Apache-style shirt and headband. 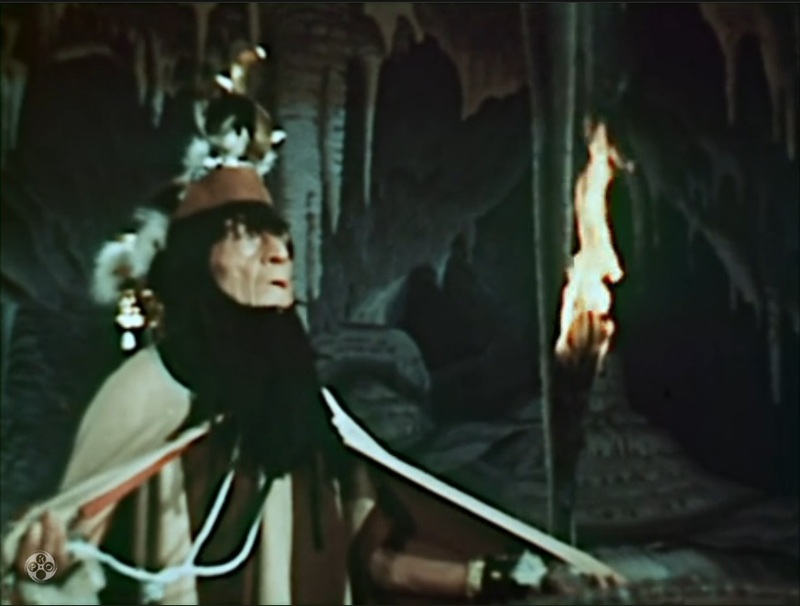 After killing the professor, the crooks enter a cave and encounter the Face of Death, which naturally frightens them to death. Cisco and Pancho encounter the last dying crook and learn the story. Back in town, they tell what they know to the professor's daughter. She's kidnapped by more desperadoes who want the treasure, but Cisco and Pancho rescue her. They all converge in the cave, where they find the treasure and the Face. A crook shoots at the Face before Cisco corrals him. Turns out Tecia was using the Face to imitate the Aztec god while guarding the treasure with blow darts. He sadly dies and Cisco decides to seal the cave with explosives. With his weird beard, Quetzal looks like something out of the Bible. I'm not sure Aztec priests ever wore a vulture headdress like his--but I'm not sure they didn't. At least Quetzal isn't a Plains chief or a generic Indian. The northern Mexican location isn't a bad place for the Aztec to hide their last treasure. It was within their sphere of influence but away from the Spanish invaders. It's a plausible premise on which to base a story. Although Tecia appears only briefly, he's a noble character. There's nothing especially savage about him. He dies honorably to protect his people's heritage. 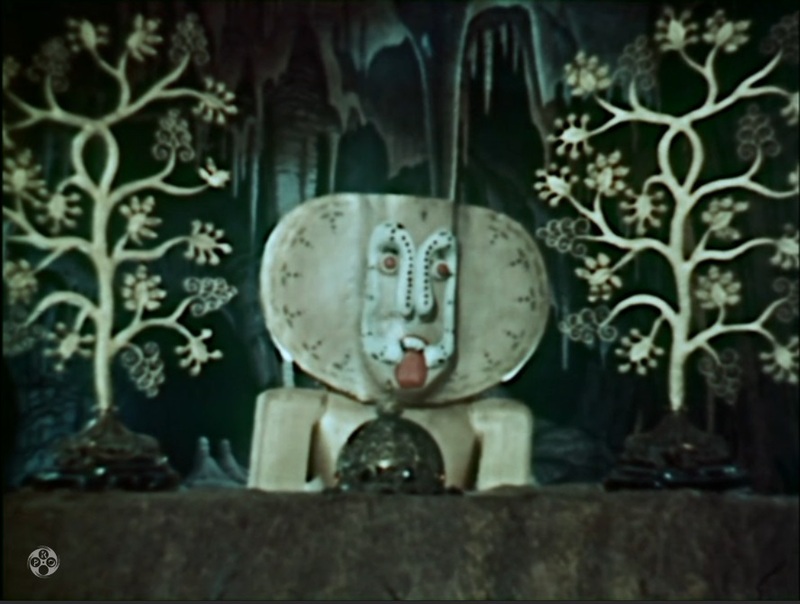 The "Face of Death" is by far the silliest aspect of this episode. It looks more like an African idol than anything Aztec. It conveys the stereotypical idea that Native religion is ungodly and evil by definition. All in all, Face of Death was a decent effort for television in 1952. We've seen things in the last decade or two that were much more stereotypical. Do Dominican totem poles exist?